The forums, held at San Antonio College's McAllister Auditorium, was hosted by Mayor Julián Castro, area businesses and education organizations. It was moderated by Steve Spriester of KSAT-12 and Brenda Jimenez of Univision. In the Tuesday forum, participants from the San Antonio Independent School District were James Howard, District 2; Joy McGhee, District 2; Patti Radle, District 5, and Sharon Monreal, District 5. For the district encompassing Schertz, Cibolo and Universal City, candidates were J.C. Dufresne, Place 2 and Robert Westbrook, Place 2. For the at-large positions at the Southwest School District: Juan Martinez and Christie Rome, and for the Harlandale School District: Velma Ybarra, District 5; Chris Cantu, District 5; Mary Lou Sandoval, District 6; Anthony Alcoser, District 6; Ted Montelongo, District 7 and Jesse "Jay" Alaniz, Place 7. An archive of the webcast of the Monday night's forum - with candidates from Judson, Northside and Southside districts - is here. The candidates from Judson were Johnny Harris, Place 6; June Adair, Place 6 and Beth Sutton, Place 7. Participating for slots in the Northside were Rolando Garcia, Place 1, Bennie Cole, Place 2 and Bobby Blount, Place 4. For the Southside Independent School District: Loren Brewer, Place 1; Frank Cannon, Place 2; Alma Rosa Vela-Guzman, Place 6; Rey Gonzales, Place 6 and Norberto Chavez, Place 7. Opening up the debate, Castro told the audience and candidates, the school board races were important in light of the expected state budget cuts in education. Castro said he coordinated the forums to focus light on the races and encourage both voter and candidate participation. 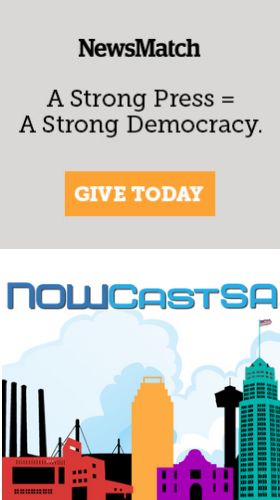 If you sign up for NOWCastSA, you can comment here as well!